The National Repertory Orchestra will present a free community concert at the Breckenridge Riverwalk Center tonight. The NRO is an intensive fellowship that prepares young musicians for orchestral music careers while providing them with the highest level of musical experience. Tonight’s free concert is an opportunity for the orchestra to thank the community for its support, and seating is first-come, first-served. The repertoire selected for the first half of this concert is Johannes Brahms’ “Hungarian Dances” Nos. 1, 3 and 10; Henri Vieuxtemps’ Violin Concerto No. 5 in A Minor; and Arturo Marquez’s Conga Del Fuego Nuevo. Brahms’ popularity extends through his four symphonies and famous violin concerto, but his smaller works are also highly enjoyable. His “Hungarian Dances” are based on Hungarian folk themes and are among his most popular works today. Vieuxtemps, a contemporary of Brahms, was a Belgian composer and virtuoso violinist. His friend Robert Schumann compared him to the illustrious violinist Nicolo Paganini. Vieuxtemps’ Violin Concerto presents a difficult challenge for the soloist, Hugh Palmer, who will be performing the work at this concert. Palmer is co-concertmaster of the National Repertory Orchestra. Returning for his second year, Hugh received his artist diploma at the Colburn Conservatory under Robert Lipsett. He earned his bachelor’s degree in music performance at Northwestern University under Almita Vamos. 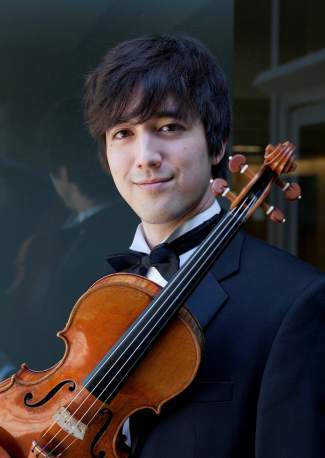 He has served as concertmaster of the Colburn and YMF Debut orchestras and the Pacific Music and Chautauqua Festival orchestras. For the second half, the National Repertory Orchestra, along with Maestro Carl Topilow, will perform the exciting and dynamic “Petrushka,” a ballet score written by Igor Stravinsky. Stravinsky wrote many scores for ballet, including “Rite of Spring,” which just celebrated its 100th birthday on May 29. Stravinsky actually composed “Petrushka” before “Rite of Spring,” in 1911, but revised the instrumental parts in 1947. The 1947 version will be played at this concert. The story of Petrushka centers around three carnival puppets, “the shy clown Petrushka, who is made of straw and comes alive with human feelings; a ballerina with whom he falls in love; and a black-hearted villain, a brutal Moor,” said Douglas Adams, CEO of the National Repertory Orchestra. Petrushka will be featured during the entire second half of the concert. The Gold Pan Restaurant & Saloon and Blue River Bistro are sponsoring the concert.